Death notice of C.B. Redmond, who was born Martha Gideon in Beirut. Announcement of funeral time and location. There is a disparity in her name. In other accounts, she is referred to as Martha Gideon Redmond rather than C.B. Redmond. 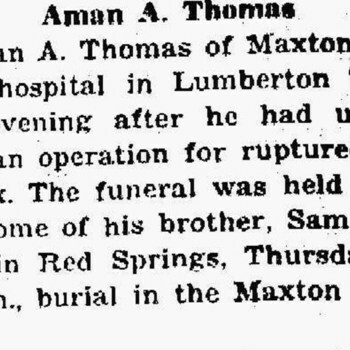 Record of death of Aman A. Thomas. Death announcement for Aman A. Thomas. Death announcement for John Gideon Redmond. Death announcement for Rujina Sadan Amash who was connected to Elon College. Death announcement for George Beshra Thomey.